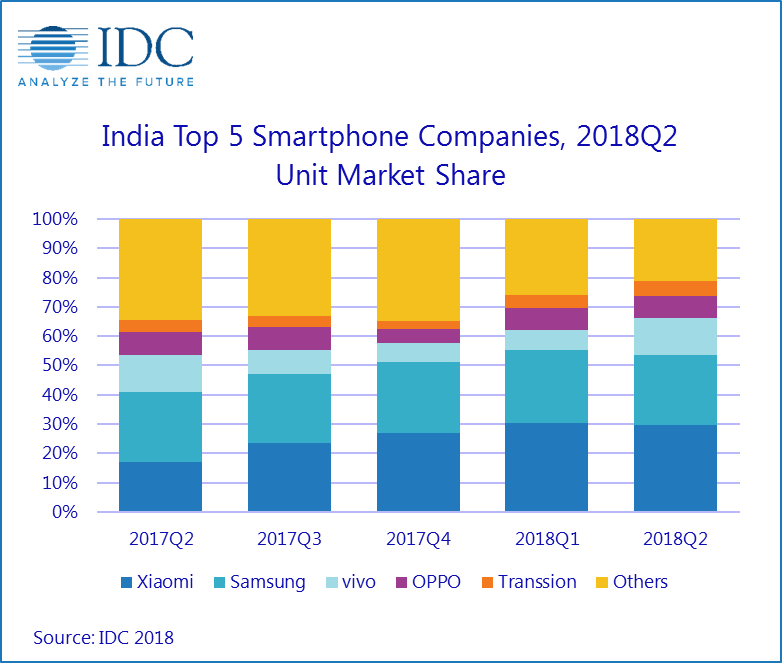 According to the IDC India’s (International Data Corporation) Quarterly Mobile Phone Tracker, smartphone companies shipped a total of 33.5 million units to India during the second quarter of 2018 (2Q18), resulting in a healthy 20% year-over-year (YoY) growth. IDC believes that this is the result of a slew of online exclusive launches and strong shipments by offline heavy vendors on the back of high decibel promotional activities and channel schemes. In the online segment, Huawei with strong shipments of its Honor branded phones, climbed to the second position with an all-time high of 8% share in online segment in 2Q18. “Huawei has had a stellar quarter worldwide moving into the second position, toppling Apple. In India, with a refreshed focus it has been able to grow its share in the online space in the last two quarters, on the back of several new launches across price segments. IDC believes Huawei should be seen as a serious long-term player in India market with all the ingredients to challenge Xiaomi and Samsung” adds Joshi. Other online-focused vendors with online exclusive launches were OnePlus with its new launch OnePlus 6, Realme with Realme1 and Asus with Zenfone Max Pro series, all of which led to an annual growth of 44% in the online channel shipments and taking the online share to 36% of the smartphone market. Offline segment growth was driven by vivo which had strong shipments during the quarter on the back of high decibel marketing campaigns around new launches like V9 including advertisement campaign featuring popular movie star Amir Khan, title sponsorship in Indian Premier League cricket tournament and attractive booster schemes available for channel partners. “The growing popularity of financing schemes in the offline channel across model portfolios by almost all vendors is driving affordability and thus pushing the overall smartphone ASP’s to a record high of US$167 in 2Q18 from US$157 in 2Q17.”, adds Joshi. The premium end of the market (US$500+) grew almost two times year-over-year (YoY) mainly due to continued strong shipments of Samsung Galaxy S9 series and OnePlus 6, with OnePlus surpassing Apple to be the second biggest player in the US$500+ segment with a share of 21% in 2Q18. The feature phone market remained resilient with shipments of 44.0 million units in 2Q18, seeing a growth of 29% over 2Q17. Reliance Jio, the telecom operator and the main driver of the 4G feature phone segment with its JioPhone range of phones, remained the top vendor in the overall feature phone market. However, the 4G feature phone market saw a slight decline of 10% QoQ with 19.0 million units. IDC believes that this drop is due to JioPhone inventory buildup from 1Q18. Reliance Jio, as an attempt for clearing this inventory, recently introduced the "Monsoon Hungama" feature phone exchange offer and brought popular apps like WhatsApp, YouTube on JioPhone. The 2G feature phone segment continued to decline further as local players struggle for survival in this segment and segment is losing relevance due to the aggressive push in the 4G feature phone segment by Reliance Jio. Xiaomi maintained its leadership position with its highest ever shipments in a single quarter in 2Q18. The vendor’s shipments saw a growth of 10% sequentially and grew more than two-fold annually. Its four smartphone models captured the top four slots in top models ranking, namely Redmi 5A, Redmi Note 5 Pro, Redmi Note 5 and Redmi 5, together accounting for 26% of overall smartphone shipments. Samsung remained at the second position in the smartphone market with an impressive 21% Year-over-year (YoY) growth at the back of its newly launched “infinity” series model namely Galaxy J6. The brand continues to see strong shipments of its successful low-end models – Galaxy J7 Nxt, Galaxy J2 (2017) and J2 (2018), thus driving overall volumes. The high-end segment (US$500 and above) saw incremental demand with cash back offers and financing schemes across channels. Vivo reclaimed its 3rd position, as its shipments grew more than double from the previous quarter, registering a strong 18% year on year growth in 2018Q2. The hit models namely Y71, V9 and Y83 being the key volume drivers. OPPO slipped to 4th position, however, its shipments grew by 15% Year-over-year (YoY) in 2Q18 due to fewer marketing initiatives and absence of attractive offline channel schemes. Transsion continued to be at the 5th position, as its offline focused Tecno branded phones grew by 26% followed by itel with 14% QoQ growth in 2Q18. The online exclusive brand Infinix grew by 45%, registering an overall 53% Year-over-year (YoY) growth for the company. Transsion's stability in the market can be attributed to successful channel management, focus on the low-end segment and strong retailer connect. “India will be the fastest growing large smartphone market for the next few years, making it a must for any smartphone player to be here. However, with increasing consolidation, it will be difficult for any new brand to carve a space here. IDC estimates the India smartphone market to continue growing in low double digits for the next couple of years. 2H18, with multiple sale events in the run-up to the Diwali festival, will be even bigger with growing aggression by online players, the sustained relevance of offline channel and several new launches planned by key vendors across price segments.” says Navkendar Singh, Associate Research Director, Client Devices, IDC India.